Certified by third-party inspector FLOCERT, which regularly audits participants. This certification ensures a fair price is paid to smallholder farmers and a Fair Trade premium is paid, which goes towards the development of the local community. Crops are raised sustainably without GMOs, pesticide use is reduced though standards are not as strict as organic. 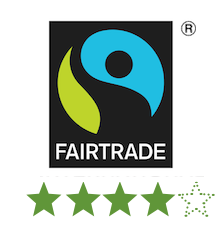 FairTrade International only certifies cooperatives. FairTrade certified products are mostly food items (coffee, tea, chocolate, bananas, rice etc.). Has stringent regulations for the ingredient contents within a FairTrade product, if an ingredient is available under the FairTrade standard it cannot be substituted for a conventional variety. 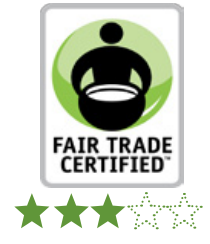 Certified by SCS Global Services (SCS) a third-party independent verifier which enforces standards and compliance criteria developed by Fair Trade USA. Ensures products (most commonly coffee, chocolate, bananas, tea, and sugar) are produced free of forced labor or poor working conditions. Establishes a minimum price for goods, so smallholder farmers do not fall prey to market fluctuations. Allows for the certification of large farms or plantations as well as corporate owned farms and/or plantations. Allows for the use of non-Fair Trade ingredients within a product despite the existence of a Fair Trade version. Certified by the Institute of Marketecology (IMO), an independent third-party certification, which specializes in international inspections of environmental and social standards. This product certification is based on a non-product-specific standard. Food and non-food products alike from raw materials to the finished product can be certified. 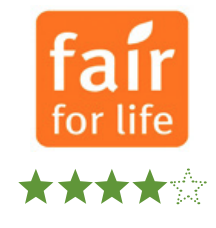 Fair for Life also certifies entire companies. Ensures fair and positive practices between producers and the companies that purchase from them. 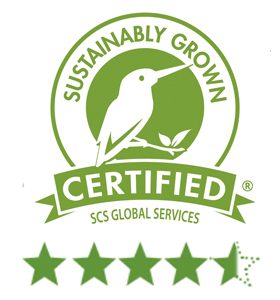 Certified by SCS Global Services, a third-party organization that provides environmental and sustainability verification, certification, auditing, testing, and standards development. This certification addresses a broad range of environmental, social, and economic sustainability issues pertaining to crop production. (Note: this standard does not address animal husbandry or welfare). Specific environmental protection issues addressed include production system parameters, soil and water resources, air quality, climate change, ecosystem protection, energy efficiency, and waste management. Social responsibility requirements cover work agreements, wages and benefits, working hours, child labor, non-discrimination and freedom of association, human resource management, health and safety, and community relations. Economic sustainability issues addressed include business accounting and reporting, continuity and resilience, community economic engagement, and product quality and safety. 1. First, we considered whether the label evaluates a practice that could lead to measurable benefits. For example, organic labels are certifying practices that prohibit the use of synthetic chemicals and therefore seek to reduce impacts on the environment and human health. This leads to measurable benefits. By contrast, “farm fresh” is meaningless since it does not define practices that create any measurable benefits. 2. We then looked at whether the label represents a legal or regulatory standard that is clearly defined. For example, the USDA organic standards are clearly defined by the USDA, and those standards are publicly available. By contrast, the words “naturally raised” are not regulated, and are meaningless. 3. We then considered whether the standards set forth by the label are subjected to third-party certification or audit. The use of an outside certifier and/or auditor helps to prevent greenwashing that can easily occur with self-regulated labeling. Labels that received the highest marks from Green America (4 to 5 stars) are those that scored the highest on the criteria above.